Enjoy the light-flooded ambiance throughout the house, provided with many native natural materials. Easy to feel good! 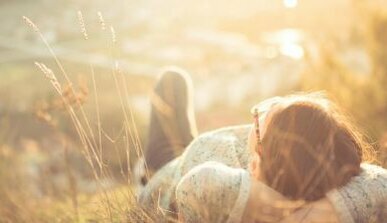 Follow your dreams and wishes, let go of your everyday stress, make use of your free time - enjoy your life to the full. This is what we want to achieve by creating a pleasing ambience. Spend a few wonderful days in our hotel in Kirchberg in Tyrol and let yourself be enchanted by the beautiful Kitzbüheler Alps! Here with us at the ALPEN GLÜCK HOTEL as well as our region we can offer you numerous possibilities to relax and to leave behind the daily grind. With our partly untouched nature you will learn again to value the important things in life and simply be happy. 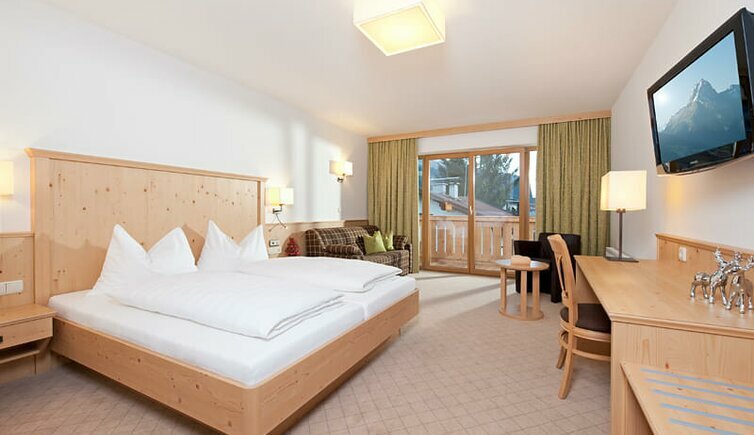 Our double rooms "Alpen Glück" invite you to enjoy and relax with a spacious living area of 20 – 28 m2 and mostly balcony. Warm colours and wooden furniture convey a feeling of home. The new nature stone bathrooms with barrier-free shower and bathtub, WC, hair dryer, cosmetic mirror, hair & body shampoo and cosmetic tissues offer an area where you can truly feel comfortable and at ease. 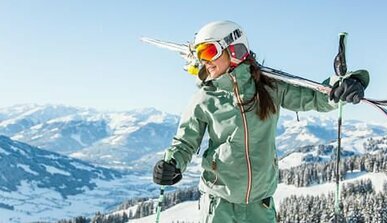 In order to completely fulfill your “alpine luck” , take in the impressive mountain scenery around you, which the Kitzbüheler Alps have to offer. Our unique new rooms "Alpen Glück SUPERIOR" with a spacious living area of 20 – 28 m2 and mostly balcony offer sophisticated room character in Alpine Lifestyle with lots of special wood, leather and practical details. Cuddly box spring beds do the rest. The nature stone bathrooms with barrier-free shower and bathtub, WC, hair dryer, cosmetic mirror, hair & body shampoo and cosmetic tissues offer an area where you can truly feel comfortable and at ease. 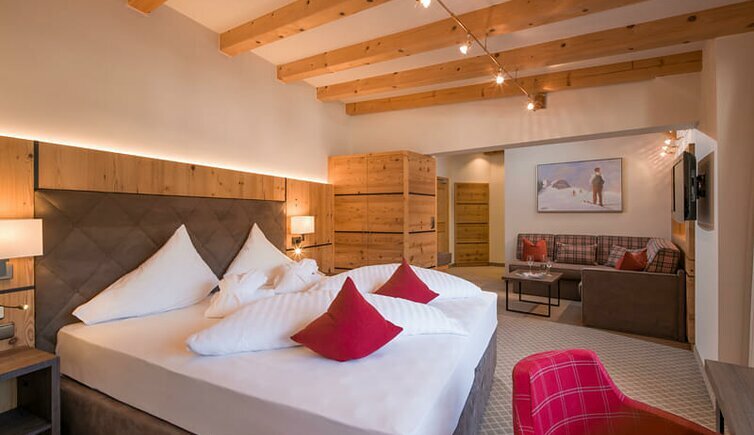 Our newly designed double rooms “Natur Pur” offer a space up to 32m², where you enjoy wooden furnishing (local spruce) and warm earth colours and in which you will experience pure holiday luck. The spacious nature stone bathrooms (5 m2 of space) with barrier-free shower, WC, hair dryer, cosmetic mirror, hair & body shampoo and cosmetic tissues also offer an exclusive and comfortable zone where you can truly feel at home. 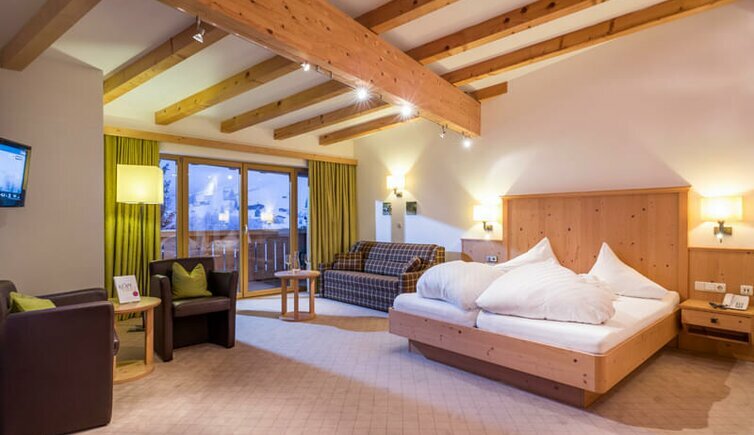 A panoramic window and mostly a private loggia with view towards the impressive mountain scenery around Kirchberg round off our perfect room offer. Our newly designed double rooms “Inspiration” offer 32 m2 of space, a ceiling height of up to 3 metres and visible ceiling beams, where you enjoy wooden furnishing (local spruce) and warm earth colours and in which you will experience pure holiday luck. The spacious nature stone bathrooms (5 m2 of space) with barrier-free shower, WC, hair dryer, cosmetic mirror, hair & body shampoo and cosmetic tissues also offer an exclusive and comfortable zone where you can truly feel at home. 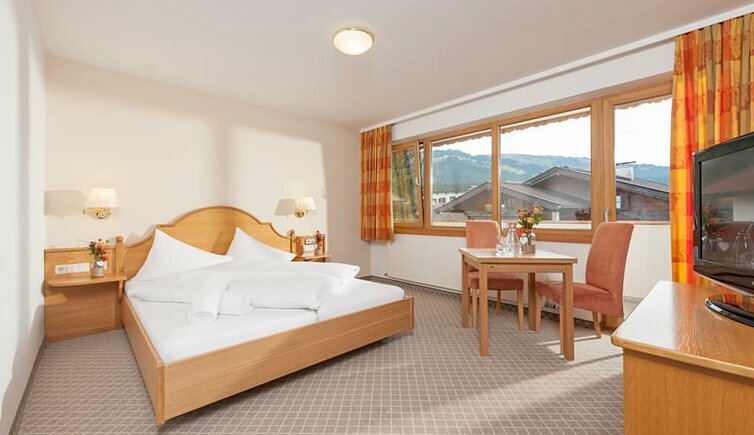 A panoramic window and a mostly private loggia with view towards the impressive mountain scenery around Kirchberg round off our perfect room offer. 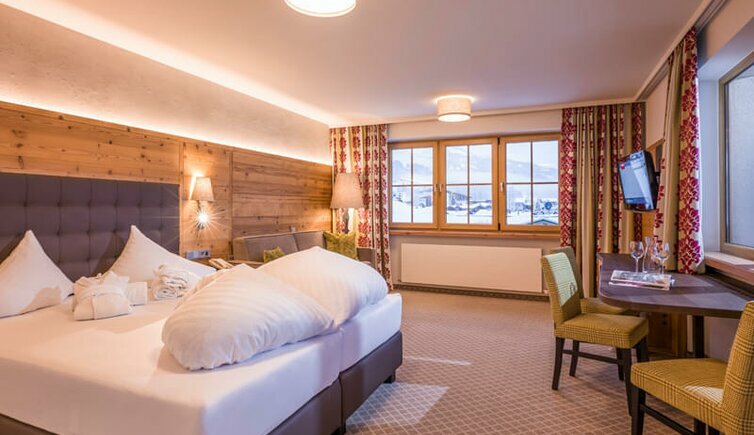 Come suggerisce il nome, la nostra Junior Suite "Panoramablick" offre una splendida vista sulle montagne di Kirchberg e Kitzbühel. Dal Kitzbüheler Horn passando per la Fleckalm, dal Maierl fino al Gaisberg - godetevi il panorama montano senza restrizioni delle Alpi di Kitzbühel con un fronte di vetro occidentale e meridionale e un ampio balcone! Questa categoria offre una stanza di circa 40 m² di benessere, dotata di luce, legno di abete locale e tonalità calde della terra. Il bagno in pietra naturale di 8 m² con doccia senza barriere, WC, asciugacapelli, specchio per il trucco, shampoo per capelli e corpo e fazzoletti per il viso offre anche un'accogliente e nobile area per sentirsi a proprio agio. Prenotabile per un massimo di 5 persone. This category offers you about 40 m² of comfort space, a cozy boxspring double bed, a cozy seating corner with flat-screen TV and canvas prints with character. A balcony does the rest. The generous bathroom with a shower, WC, hair dryer, cosmetic mirror, hair and bodyshampoo and cosmetic towels is also a comfortable, noble area to feel comfortable all around. The special feel-good extra: the infrared shower "Intense Pur" from Physiotherm gives you a new vibe after an extensive hike or a long day of skiing! Very good family hotel. Close to the city center with easily acessible parking. Fantastic service. Seestrasse 3 - A - 6365 Kirchberg in Tirol 821 m a.s.l. Enjoy hours of pure happiness with your loved one - we are happy to offer you a romantic stay at our Hotel Kirchberger Hof! No matter if you prefer to enjoy this trip on your own or together with your family - within the skiing region of Kirchberg everybody can enjoy oneself - have a look yourself ..
No matter if you prefer to hike, walk or stroll around - the Kitzbüheler Alps build the perfect surrounding for many beautiful experiences during your holidays! 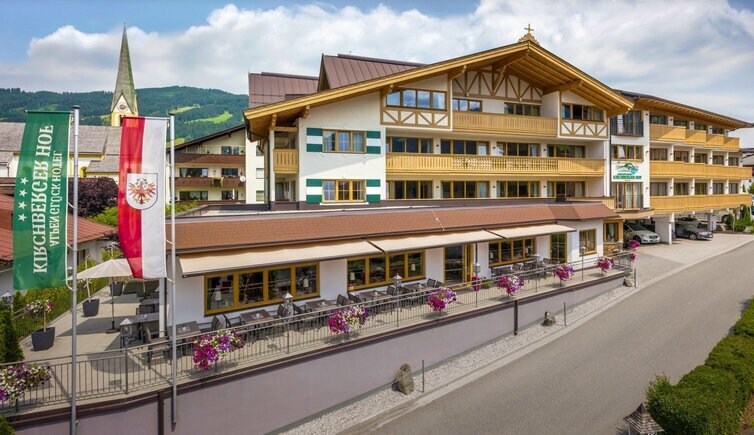 Hotel Kirchberger Hof: The Mountain calls – Experience Alpine happiness! The Mountain calls – Experience Alpine happiness! 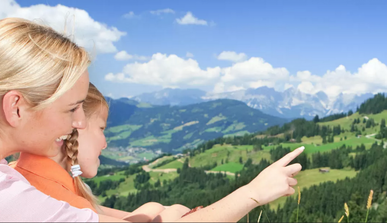 Discover the mountain range around Kirchberg and enjoy a few unique hiking trips! For 7, 6, 5, 4 or 3 days. Price on request. 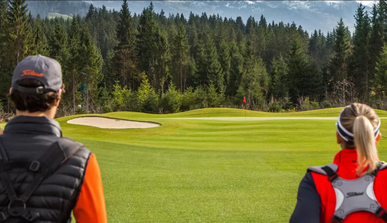 You love nature and you like to play golf? Then this offer should be the perfect package for your holidays! We are looking forward to welcoming you at the Hotel Kirchberger Hof! 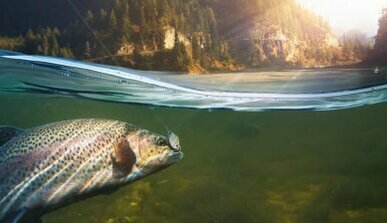 Silence, tension, streams, relaxation, pure nature and then - a catch! Our fishing area stretches along the Spertentaler Ache up to klausen and offers marvelous excitement! 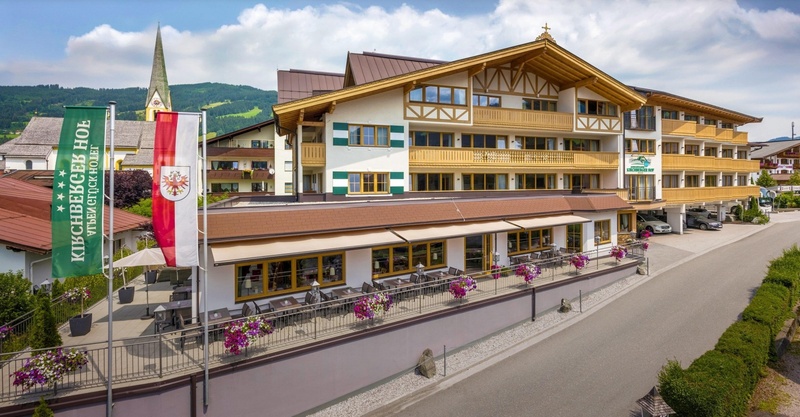 Hotel Kirchberger Hof (Kirchberg in Tirol) is responsible for the content of this page.